The $33 bln streaming service is growing quickly and inching towards profitability. Yet investors are already giving the group credit for its ambitious targets. Powerful labels like Universal have every reason to make life difficult for boss Daniel Ek. 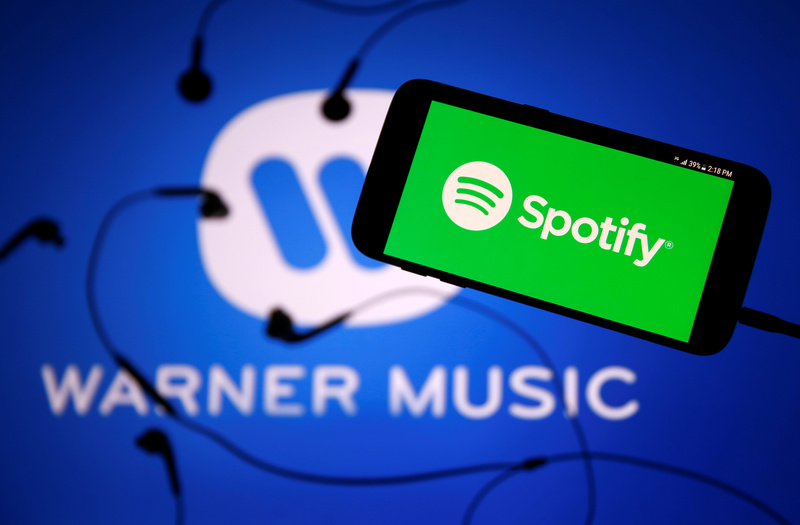 A smartphone with a headset with Spotify logo are seen in front of a displayed Warner Music logo in this illustration picture taken July 24, 2017. Shares in Spotify Technology closed at $183.71 on Sept. 12, or 39 percent above the reference price set by the New York Stock Exchange before its April direct listing. The Swedish music-streaming service will be out of contract with all three major record labels in just over a year time, according to an Aug. 14 report by industry website Music Business Worldwide. Variety magazine reported on Aug. 7 that Warner Music Group had sold its entire stake in Spotify. Sony, which owned 5.7 percent of Spotify in April, has sold shares, taking it below the 5 percent threshold for disclosing its holdings. Vivendi, owner of Universal Music Group, said in April that it sees Spotify as a strategic partner and intends to keep its stake.